Is this a reference to Princess Vespa (Space Balls) or Princess Toadstool (Mario Bros.)? …somehow the mashup really works well! Nice one, Alina! It is sort of a combination of Episode IV and Episode IV. why can’t I comment on any but the newest comic…? Anyway, I was just going to comment about the cubic foot of dice: In the Dragonball Z game, you roll dice equal to your power level. Even the weakest characters have power levels in the hundreds. So…. You just know that most of the people at the con will be complimenting Jess on her clever meta and she will just be going ” . . . thank you? . . . ” with a baffled smile. 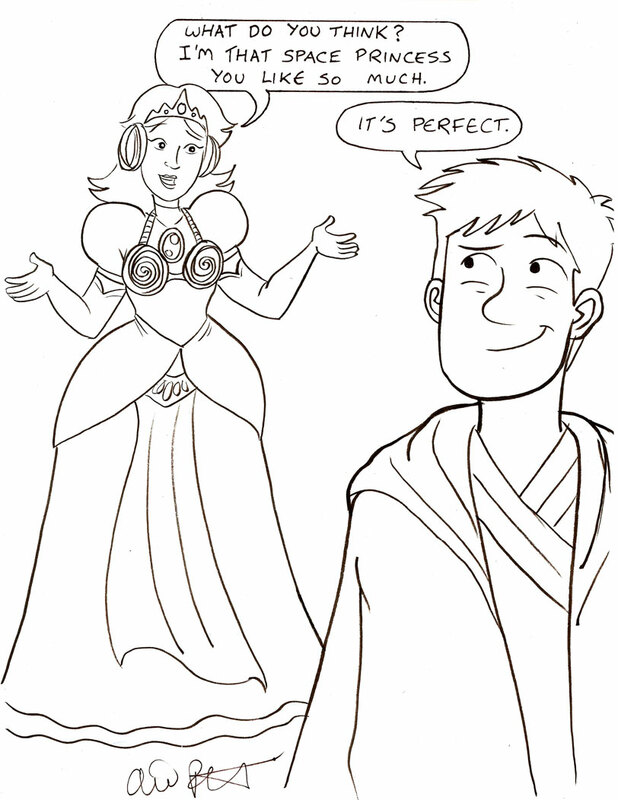 Ooo ooo and her boyfriend’s peculiar friends get wind of her costume ahead of time and ALL decide to do Disney/Star Wars mashups!! wow,…. I don’t think any geek could get angry at her for that,….. Hilarious combo, and I’m eager to see Monday’s comic! Aaaw! That is so /sweet/! That is a Mash up, of Peach (Dress, tiara, and gloves) with Leia (bun hairstyle, as well as the naughty chest braziere she wore while held captive by Jahba the Hut.) Dang it I am such a geek. I loved watching this one get drawn, that mash up is awesome XD And Mark is so sweet! I love the cosplay! I did have a question about the commission sales. I signed up for one during the sale but haven’t heard back…I tried emailing but no response. Is there another place I should be asking about this? The last of the commissions are being emailed out tonight, sorry for the delay! The Shadowrun storyline has been quite a doozy.